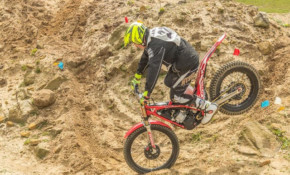 The fifth round of the Isle of Wight Motorcycle Club 2019 Trials Championship were held a couple of weeks ago. Read Wayne's report for details. The fourth round of the 2019 Winter Series Trials Championship Sunday 3rd March at Newbarn Farm, Calbourne saw five youth riders. See how they and others got on. A very special three-course meal, followed by some top sounds was a fitting way to help celebrate the achievements of Isle of Wight Motorcycle Club riders throughout 2018. The wet weather had a massive impact on the ground, which resulted in very wet and slippery conditions for the riders taking part in the Isle of Wight Motorcycle Club's Spring Cup Trial. Riders took on the four laps of eight sections at the relatively mild and overcast Sweetwater course, but unlike other venues where the sections can become easier as the day goes on, the ground deteriorated here. The traditional Boxing Day trial is not part of the Championship, but there were awards for the best Father and Son pairing, the best Novice and the best Expert riders. Prizes were also given out to the best fancy dressed rider. The Winter Series Championship is made up of thirteen trials. To qualify for an award, Adult riders must complete a minimum of eight trials, with twelve rounds to count (in the same class). The attendance was predictably low following the deluge of rain in overnight and the early hours of Sunday morning. As well as some great news about James Stay in the British Solo Trials championships, Wayne shares this report from the ninth round of the 2018 trials Championship at Bembridge Down. At the beginning of the month the Isle of Wight Motorcycle Club kick-started the second half of its main Winter Series Trials Championship at Duxmore Chalkpit, Downend. Wayne shares this report. The third and final round of the 2018 Pat Death Summer Series trials Championship was held on Sunday 22nd July at Hawthorn Manor Farm, Chale.